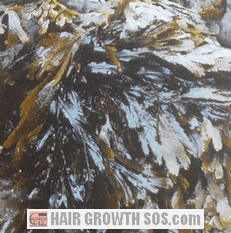 Seaweed for Hair Loss - Can Kelp or Bladderwrack Benefit Hair Growth? Eating Seaweed for Hair Loss: Can Kelp or Bladderwrack Benefit Hair Growth? Eating seaweed for hair loss and hair growth problems might be beneficial by treating three conditions. I myself tried sea kelp, bladderwrack and sea lettuce as a simple experiment (details on how I got on further down the page). Overall, from my research, I think there's both some good news and some bad news about this idea you should know about. Eating seaweed for hair loss might be worth a shot depending upon which type of hair loss it is. The three conditions below are probably the most likely ones that can be treated by adding seaweed to your diet. This is the most common type of hair loss affecting men and women, and is usually known as male pattern baldness. This type of hair loss has long been associated with the hormone DHT (dihydrotestosterone). And saturated fats in your diet can eventually get converted into DHT. So, if eating seaweed decreases absorption of the fat you consume, that might mean less DHT production and less hair loss. However, your body has the ability to convert any excess calories into saturated fat. So, if you regularly consume way more calories than your body needs (and don’t burn it off through exercise), it may well be that the amount of alginate you get from eating seaweed simply can't cope with the sheer amount of fat your body produces. But there's another way in which seaweed might help with this problem. Seaweed also contains iodine. And iodine is a mineral that can stimulate thyroid function, a gland which boosts metabolism and so helps you burn off more calories. Of course, whether or not iodine and alginate can together counteract the negative effects of too many calories and too much saturated fat is unclear. But it might be worth a try. Learn more about the link between saturated fats and DHT production? Eating seaweed for hair loss caused by a deficiency in one or more of the nutrients that seaweed contains is not a bad idea. Seaweed contains all sorts of nutrients beneficial for hair growth including the minerals iron and iodine (as mentioned above). So if you suffer from chronic telogen effluvium, which is caused by an iron deficiency, or hypothyroidism, which can sometimes be connected to an iodine deficiency, it may well be that you can address your hair loss problem, at least to some extent, simply by consuming some seaweed on a regular basis. High in fiber, protein and other nutrients. It can increase good intestinal bacteria. It can decrease cholesterol levels and blood pressure. Hormone regulation (giving a preventative effect against certain cancers - see below). Certain seaweeds can inhibit breast cancer and cervical cancer cell proliferation according to studies conducted in 2004 and 2006 respectively. Brown seaweeds especially can regulate estrogen levels in the body. The antioxidants contained in seaweeds might also be involved in this anti-cancer effect. Eating seaweed for hair loss conditions that might be tackled by its alginate content, minerals, or the many other health-promoting substances it contains, does sound like a good idea. At least in theory. But, in practice it might not be such a smart move. That's because hair loss can be a very stubborn and complicated problem to overcome. It can also have multiple factors causing it, or at least affecting its development and severity. Take androgenetic alopecia for example. I firmly believe it's caused by skull expansion, which sounds simple enough. But, skull expansion develops due to genetics and high levels of hormones like DHT (as mentioned earlier). The genes that determine skull shape dictate whether or not someone experiences skull expansion and hair loss. DHT levels are also influenced by genetics (e.g., the 5-alpha reductase and androgen receptor genes). And then there's stress. Various forms of stress can also make androgenetic alopecia even worse. So, even if the nutrients in seaweed do help a bit, none of them can stop the hair loss process itself because they don't treat the underlying cause. As for hair loss caused by hypothyroidism and an iodine deficiency, if you start eating seaweed to try and stop your hair loss by rebalancing your iodine levels, you won't really have a clue about how much iodine you're putting into your body. One portion of seaweed contains way more iodine than your daily nutritional requirement (which is only about 140 micrograms). And you can't simply blitz hypothyroidism out of your body by overdosing on iodine for, say, a few weeks either. In fact, in contrast to the previous section, a clear association has been made between excessive daily iodine intake from seaweed consumption and thyroid cancer in postmenopausal women from a 2012 study in Japan. So what about eating just tiny amounts of seaweed for several months? Would that be OK? Maybe, but that might cause another problem: some seaweeds also contain quite a lot of sodium/salt* (for obvious reasons!). So, if you already suffer from hypertension and try this idea long term, you might end up with your blood pressure shooting through the roof! And, all the while, you won't really know if the seaweed is helping you tackle your hair loss or not. *Again, this is in contrast to the previous section which states that seaweed can decrease blood pressure. Obviously then, you might need to choose carefully which seaweed for hair loss to use. Chronic telogen effluvium was also mentioned as a possible type of hair loss that seaweed can treat. However, given the possible risks mentioned above, you'll almost certainly benefit more by taking a regular controlled dose of iron in tablet form. So you see, for all three types of hair loss highlighted in the first section, simply eating seaweed to deliver a natural supply of nutrients to your body in the hope that it will miraculously reverse your hair loss and stimulate hair regrowth, is simply not going to work! You could, of course, take iodine tablets instead. These probably won't be anywhere near as natural as pure seaweed even if the ingredients include sea kelp extract for example. That's because they'll have additives in the formula. However, you should at least know exactly which nutrients you'll be taking, and in what quantities. 1. If you eat a junk food diet and think that taking supplements will somehow compensate for your bad eating habits, you’re most likely going to be wrong. That's because, if you take a few small supplements, the mass of junk food you consume is likely to far outweigh any benefit they give. Certain types of junk foods can even strip some of the nutrients from your body. 2. There are many types of hair loss, and some of these, such as those that are autoimmune diseases or caused by mechanical factors, probably won't benefit at all from any food you eat or supplements you take. 3. Obviously you shouldn't take any tablets, or start munching on seaweed for hair loss conditions without consulting a doctor first. A doctor can help you identify which type of hair loss you have and how best to treat it. If You Shouldn't Eat Seaweed for Hair Loss, Should You Eat It at All? Eating some seaweed is most likely a smart idea. It certainly should help contribute to a nutritious, varied diet and general good health. There's no doubt that seaweed is jam-packed full of nutrients (e.g., vitamins A, B, C, the minerals copper, magnesium, zinc, plus omega 3 fatty acids, etc) and so, quite rightly it deserves to be called a "superfood". But it's probably best to consume only small amounts occasionally, not every day. And if there is some kind of hair growth promoting effect, then that's a bonus! Yes. But I didn't eat seaweed for hair loss (that's something I have under control thanks to my own hair loss remedy). I did so simply because my parents live near the coast and, having studied nutrition (a lot), I knew there were many potential nutritional and health benefits by eating it in small amounts. Bladderwrack - No, definitely not a fan! Note that these opinions are obviously just my own, and also subject to me not being a very good cook! 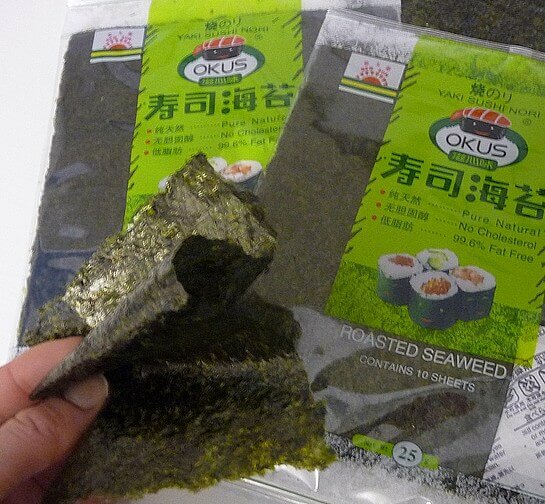 I also bought some nori seaweed sheets which I much prefer and highly recommend. If you do buy seaweed rather than harvest it yourself, look out for low salt versions, especially if you have heart issues or high blood pressure. Go to a clean beach (no sewage pipes close by!) when it's low tide (you can get this from a tide timetable) with some plastic bags and scissors or knife. Find seaweed in rock pools rather than washed up on the beach. Cut rather than pull the seaweed off (this allows the seaweed to regrow). Rinse it in fresh water (or soak it in fresh water for a few hours to reduce the salt content), then spread it out to dry. Once dry, you can store it for months. Before cooking it, soak the dry seaweed in fresh water for a few hours. Or, of course, you could simply let someone else do all the hard work and buy some healthy seaweed wraps instead. This is my preferred option (as mentioned in the last section). Although seaweed would, no doubt, be a very healthy addition to your diet, if you were to simply start eating seaweed for hair loss and hair growth issues alone, you might end up being very disappointed. Also, don't forget, it's far safer to consult with a doctor for any medical condition rather than simply self-treat. Seaweed consumption and the risk of thyroid cancer in women: the Japan Public Health Center-based Prospective Study. Michikawa T, Inoue M, et al. Eur J Cancer Prev. 2012 May;21(3):254-60. doi: 10.1097/CEJ.0b013e32834a8042. Antioxidant and antiproliferative activities of extracts from a variety of edible seaweeds. Food Chem Toxicol. 2006 Jul;44(7):1144-50. Epub 2006 Mar 22. PMID: 16554116 Yvonne V Yuan, Natalie A Walsh. Growth inhibitory potential of effective microorganism fermentation extract (EM-X) on cancer cells. Int J Mol Med. 2004 Nov;14(5):925-9. PMID: 15492867 Chung Hin Chui, Gregory Yin Ming Cheng, et al.